How to calculate marginal costs and benefits (from total costs and benefits), and how to use that information to calculate equilibrium - FreeEconHelp.com, Learning Economics... Solved! The next step is to calculate the marginal benefits (marginal utility), and marginal costs. In order to do this we should begin at 0% clean air. When we move to 10% clean air, we see that benefits go up by 50, and costs go up by 45. This means that our marginal benefit from 10% clean air is 50, and our marginal cost of 10% clean air is 45. We know these are our marginal values by using the marginal benefit and marginal cost formulas described at the beginning of this post. For example, marginal benefit is equal to the ending benefit and 50 minus the starting benefit of 0. The difference is then divided by the change in Q or 10% increase in clean air (from 0% to 10%). 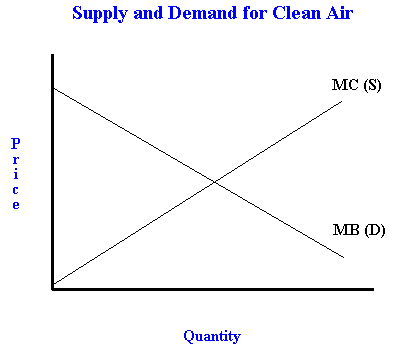 The table above shows us that marginal costs increase as more clean air is produced, and that marginal benefits decrease as more clean air is produced. This relationship holds even though total benefits and total costs BOTH increase as the percent of clean air increases. This result is consistent with the theory of diminishing marginal utility (for marginal benefits), and diminishing marginal returns (for increasing marginal costs). If we graph the marginal costs and marginal benefits, we will get our typical looking supply and demand graph where marginal costs represent supply (supply of clean air) and marginal benefits represent demand (demand for clean air). There are two ways to find the optimum amount of clean air. The most basic economic way is to figure out where marginal benefits equal marginal costs. In our table above, they are never perfectly equal, but at 70% clean air, we see that marginal benefit is 20, and marginal cost is 19. This is pretty close (the closest we can get with the information that is given), and since MB are greater than MC then this is a valid solution. The true answer will probably be closer to 71% but 70% is pretty close--and would be the most correct answer with the information that is provided. As you can see, our 70% clean air level gives us the highest net benefit. Although it is only 1 higher than the 60% clean air level, it is higher. This result is consistent with our MB = MC analysis so we should be confident that 70% clean air is the correct amount for this economy. Very well-written article! Thaks for sharing this informative post! Keep posting your articles! Very useful post, thanks. I think you should also learn more about mla style. Awesome website with awesome articles keeps up the good work.Awesome website with awesome articles keeps up the good work. Thanks for posting this useful and informative article with us..